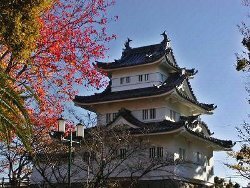 Tsu Castle is classified as a flatland castle (its layout: Rinkakushiki), and is located in Mie Prefecture. During the pre-modern age, it found itself within the borders of Ise Province. 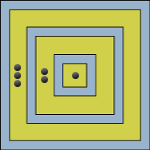 It is associated with the Tomita, Tōdō clans. Dates in use: 1571 - 1871. When the three-story turret was rebuilt in 1958, certain features were introduced to make it more visually appealing. Instead of the very vanilla-looking turrets seen in photos from the dawn of the Meji period, the rebuilt turret sports six additional gables, four on the lowest layer & two on the middle layer. Finally, it is topped off by a pair of fire-fighting Shachi. Remaining today, there are reasonable sections on stonework & about three-quarters of the inner moat.There is also a relocated gate. The striking, red gate is of the top-heavy, Yakui style. 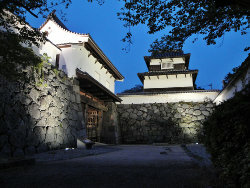 1558 Fortifications were built by Hosono Fujiatsu. 1568 Oda Nobunaga took control of the castle. 1573 Oda Nobukane was transferred here. 1577 A five-story main tower, complete with lessor tower, was built. 1594 The Tomita clan were transferred here. 1600 The castle was laid siege to by anti-Tokugawa forces at the same time as the Battle of Sekigahara. The main tower was burnt to the ground & was rebuilt in the years that followed. 1608 The Tōdō clan were transferred here, a major renovation was then carried out. 1662 The main tower burnt to the ground. It's believed the Shogunate didn't allow the Tenshu to be rebuilt. 1958 The corner turret was rebuilt.